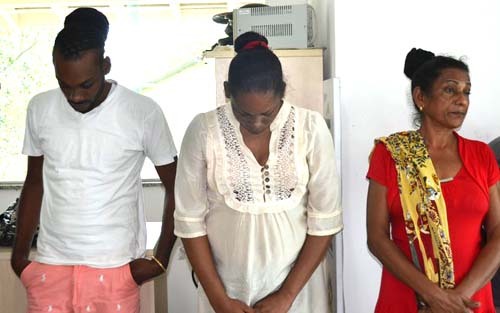 Mother, Khumwatte Narine Adams, 49, (l) daughter, Fabiola, 28, and son, Joseph, after their arrests by Brazilian police on Thursday. According to the g1.globo.com online news in Brazil, the trio was arrested on Thursday, in the Boa Vista area, which borders with Guyana at Lethem. Head of the Narcotics Enforcement Office (DRE), João Evangelista, said the family was being monitored for about two months after an anonymous tip revealed their involvement in drug trafficking. The group, according to the delegate, was ‘routinely’ supplying the capital with marijuana. 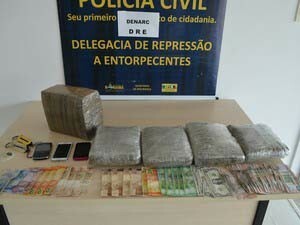 In addition to the drugs, police found $23,500, US$4 and 242 Brazilian dollars, along with cell phones. Part of the marijuana was found in women’s handbags while the rest was hidden inside a vehicle. The mother and her children were charged with drug trafficking. The marijuana, phones and cash found on the family. The mother and daughter will be held in the women’s jail while the son who is reportedly also involved in a murder, is being held at the Agricultural Penitentiary in Monte Cristo.